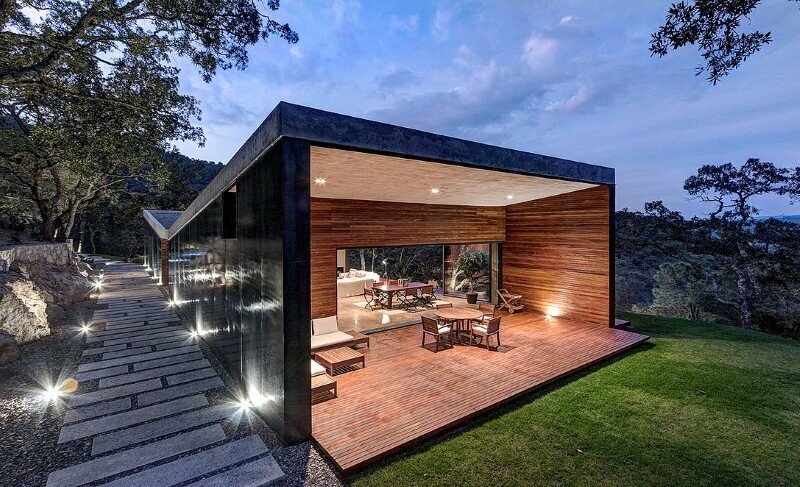 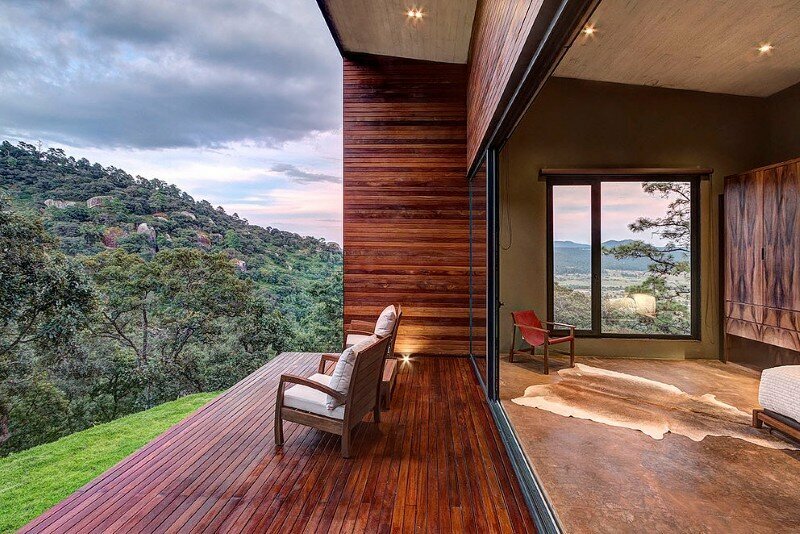 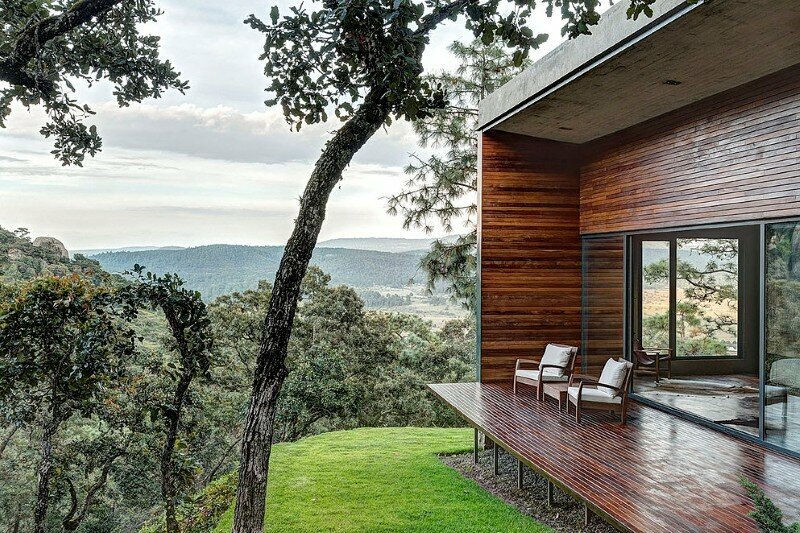 This superb weekend retreat is located in Tapalpa, Mexico, and was completed in 2015 by Guadalajara-based Elias Rizo Architects. 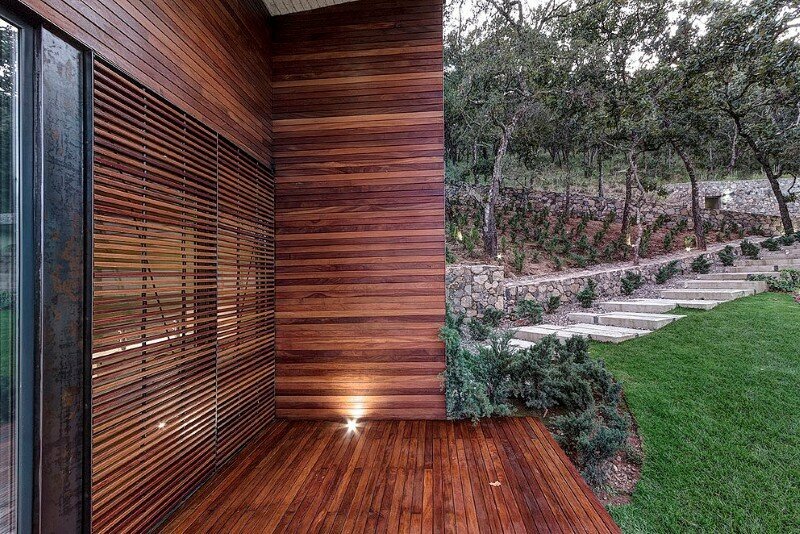 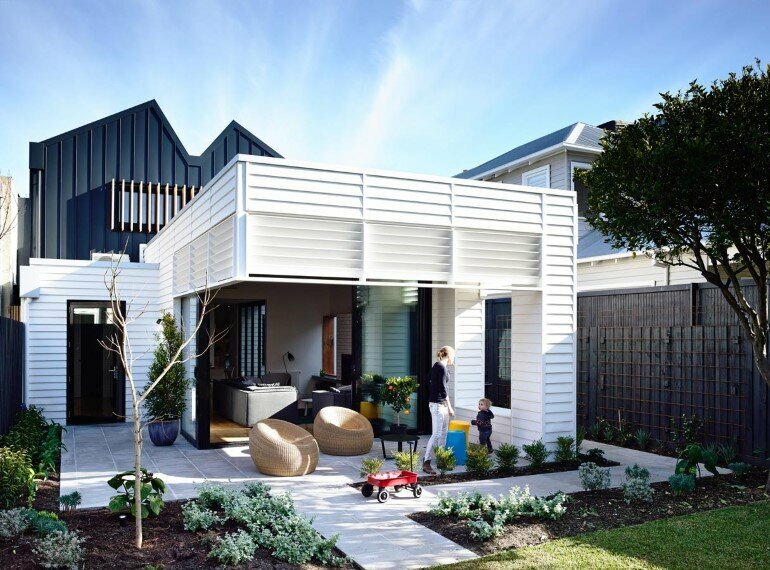 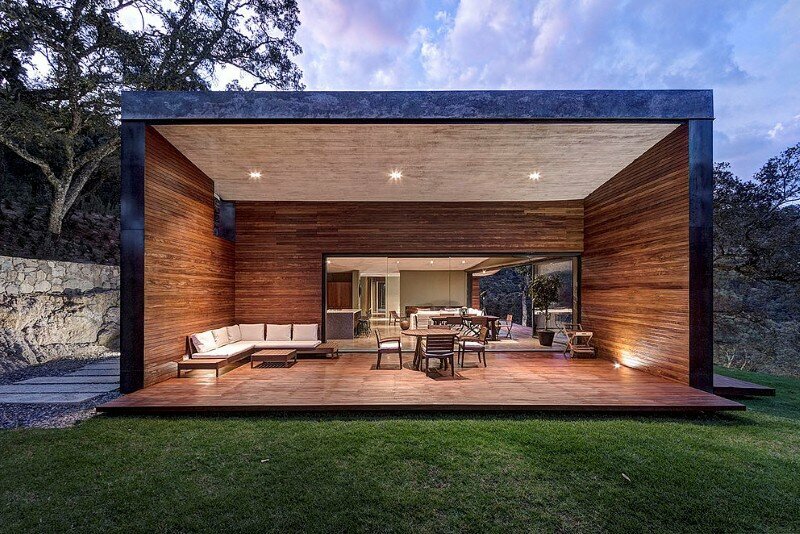 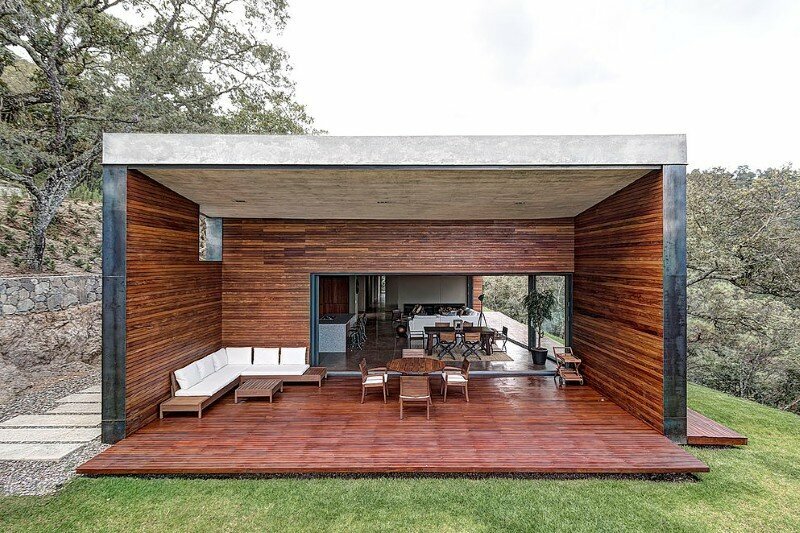 Description by Elias Rizo Architects: The project grew out of a house GG very particular commission. 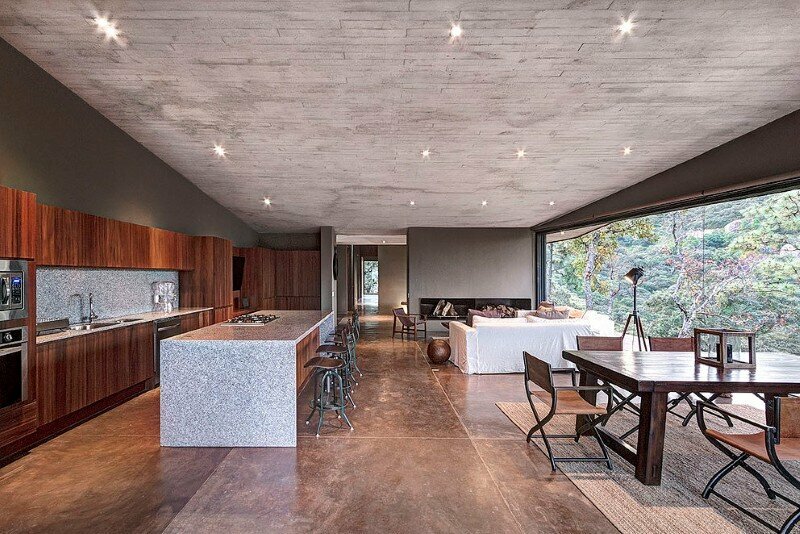 Our client, a middle-aged bachelor, wanted to build a weekend retreat in a clearing in a forest, on a property on the mountain. 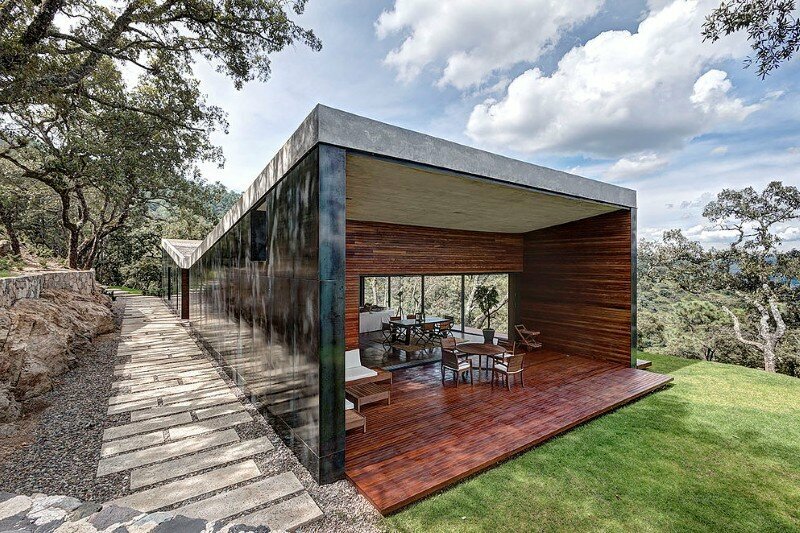 In addition to the topographical conditions, we found that the project involved unusual requirements in terms of privacy which allowed a more open relationship between the spaces and to the environment. 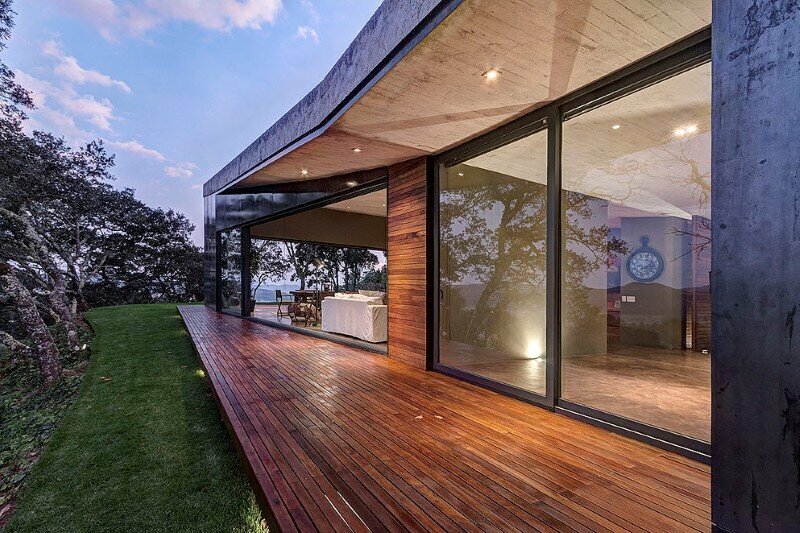 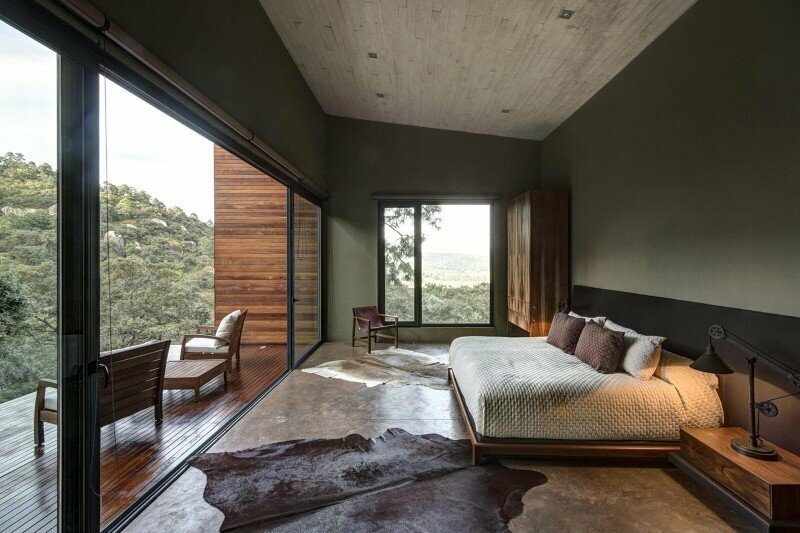 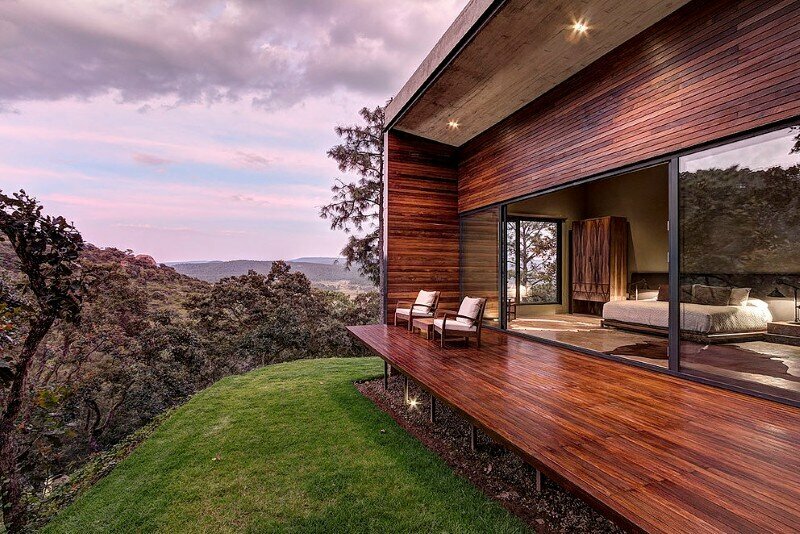 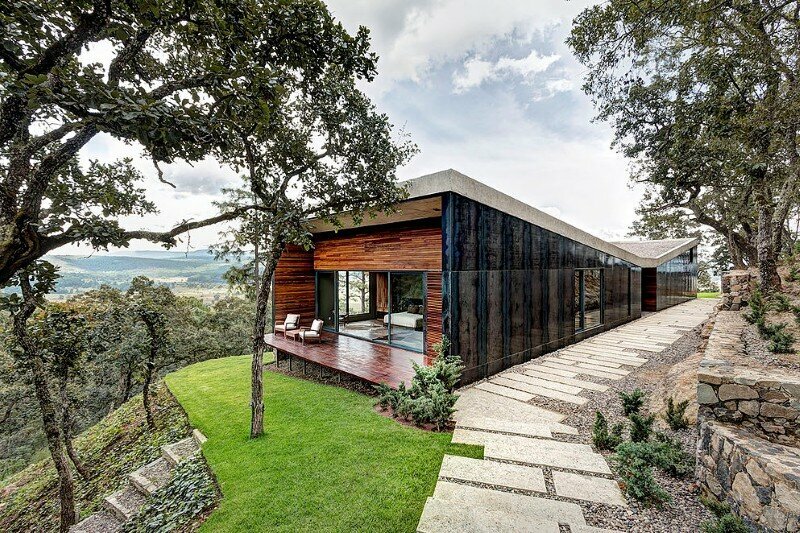 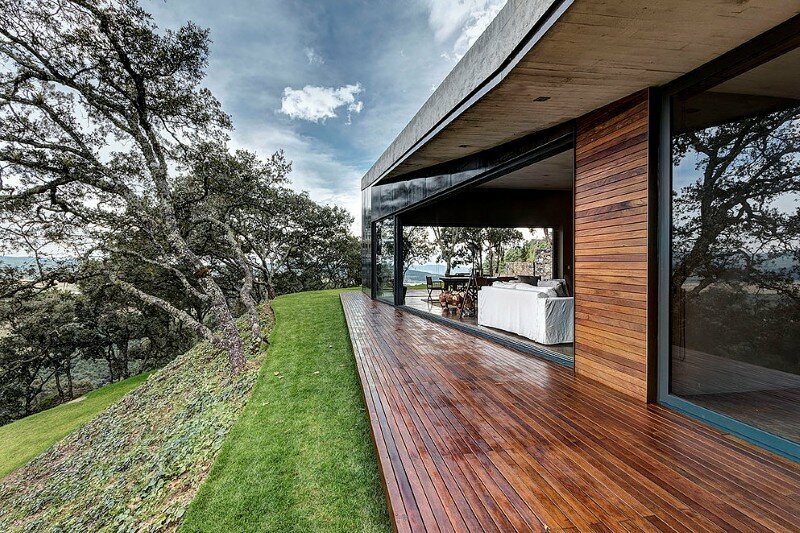 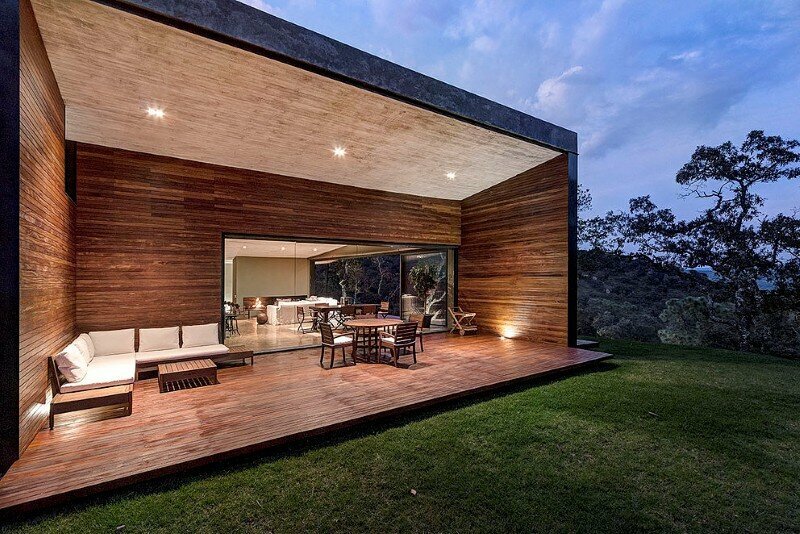 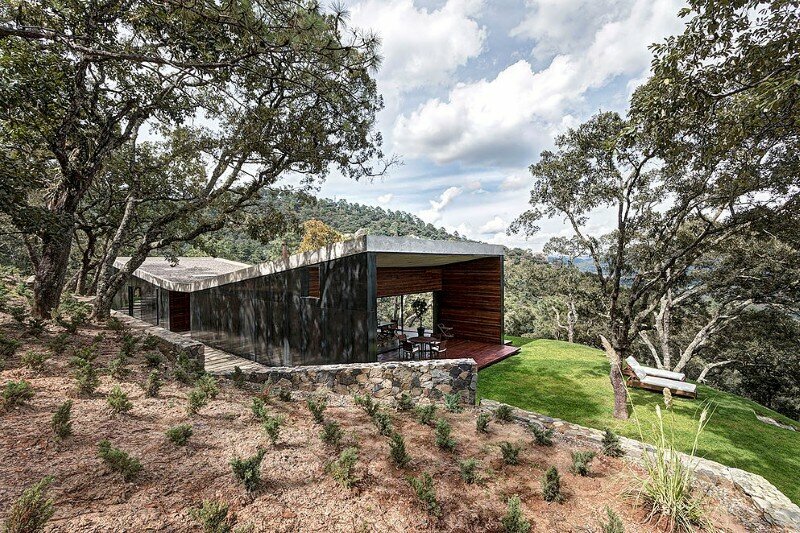 The weekend house is located in steep terrain overlooking a plain between mountains and the Colima volcano in the distance, visible above the tops of the oaks. 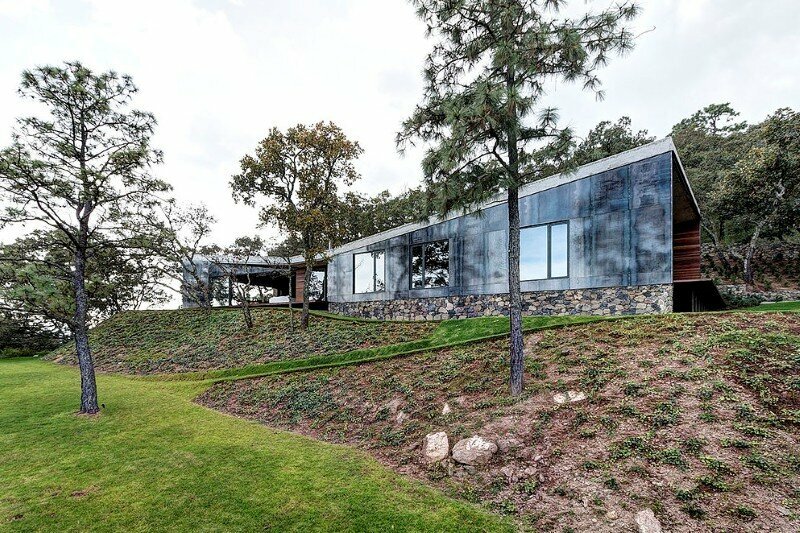 The rugged topography was a determining factor in project settings; the complex was resolved on a series of terraces that were carved into the hill and are linked by a zigzag path. 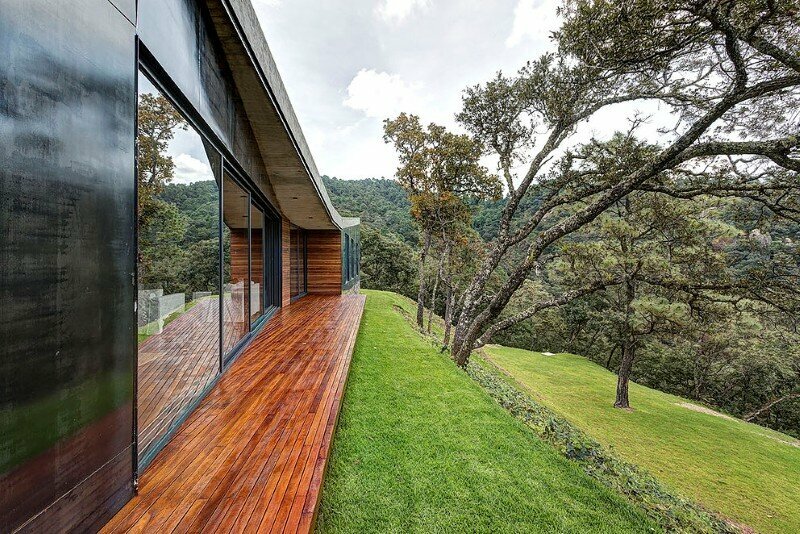 The property is accessed from the highest point. 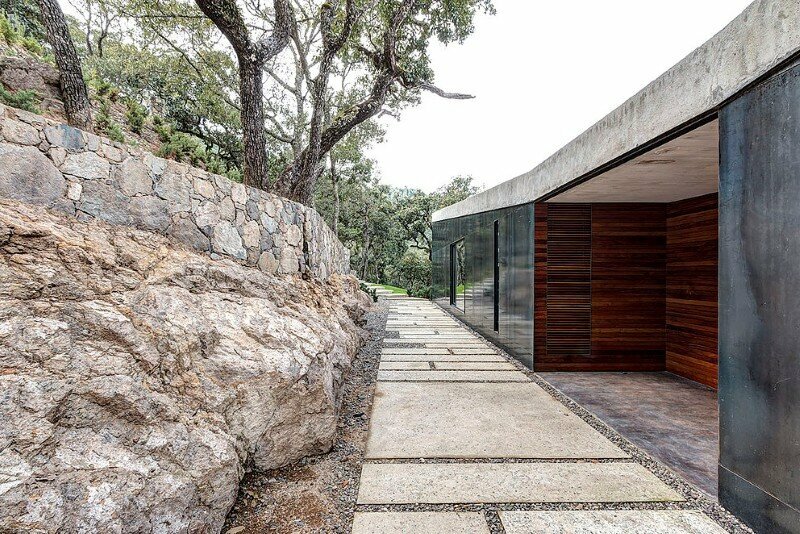 The vehicles travel along a path that cuts the slope declining towards a garage that sits on an intermediate terrace and sinks into the hill, framed by a stone portal breaststroke. 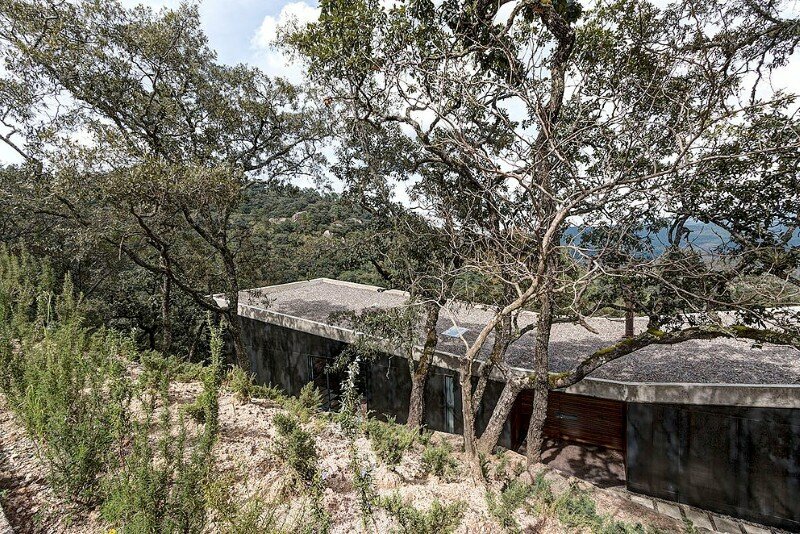 The roof of the house, the first face that confronts the visitor is seen between trees as a concrete slab covered with gravel and apparent broken building betrays profile. 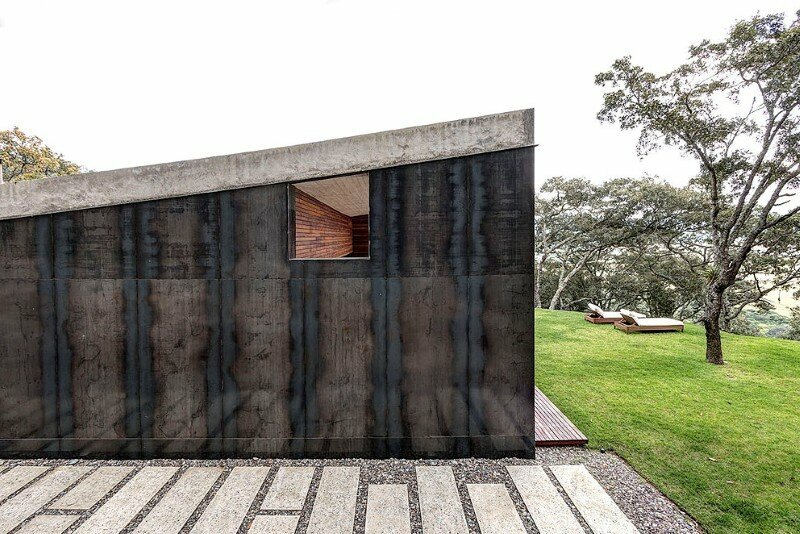 The garage born a staircase rectangular stone slabs, of variable dimensions, arising from a carpet of gravel referred to the roof and seems to suggest that the building is an extrusion of the land itself. 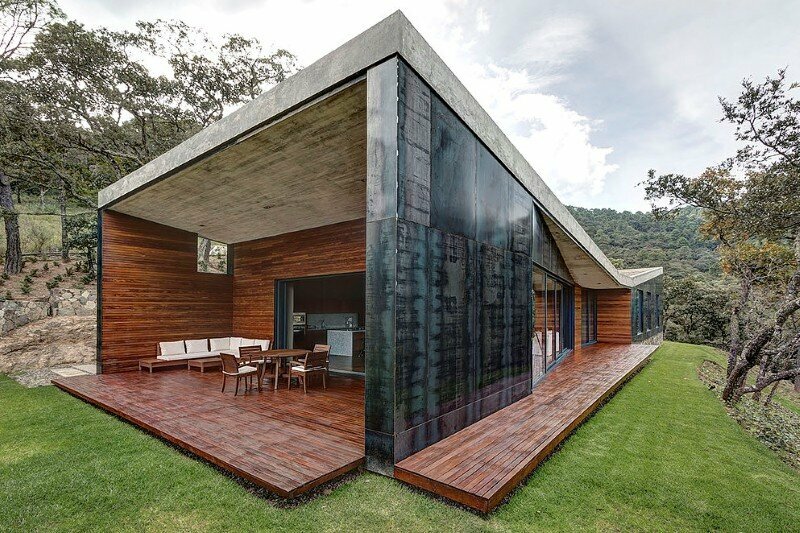 At that time the front facade of the house, which is lined with lacquered steel plate anticipated age at whim, like the rest of the material is revealed. 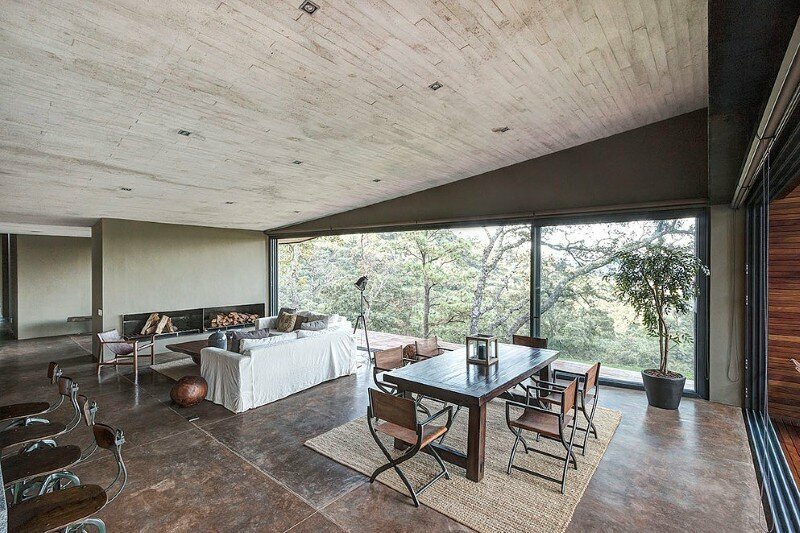 Over time the board will lose its luster and will oxidize, changing in the same way it does its surroundings, and go leaving a trail of oxide on the stone that will eventually be confused with red earth, so characteristic of the region . 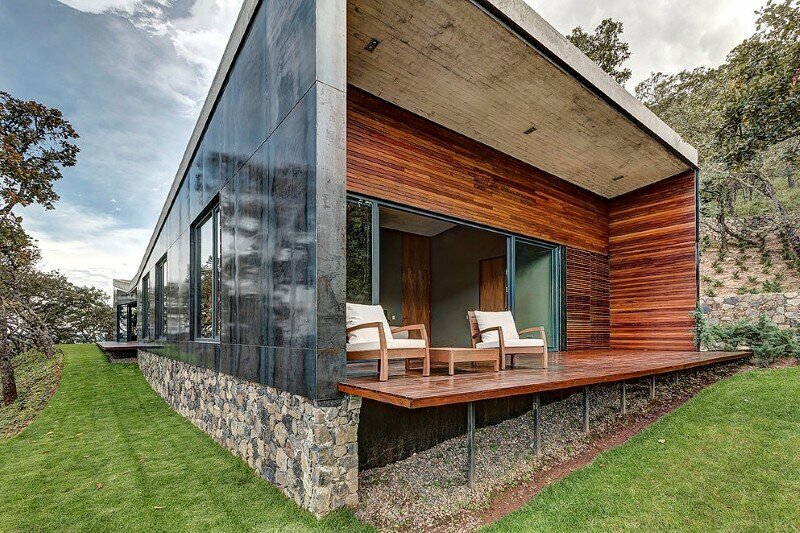 The home program was resolved in a rectangular plant that is inserted into one of the tracks the field. 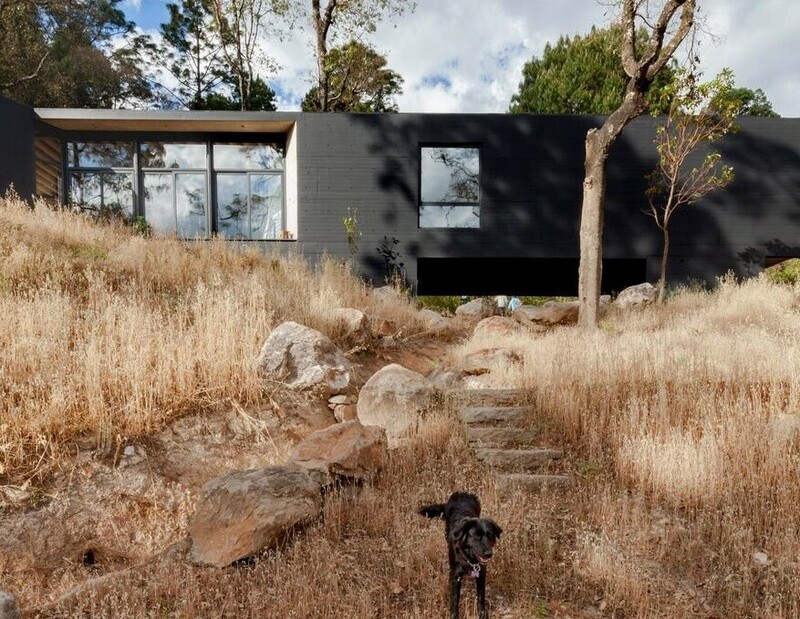 The resulting volume is a prism sitting with respect on the ground, oriented transversely to the slope of the hill and exposing its longest side towards the view. 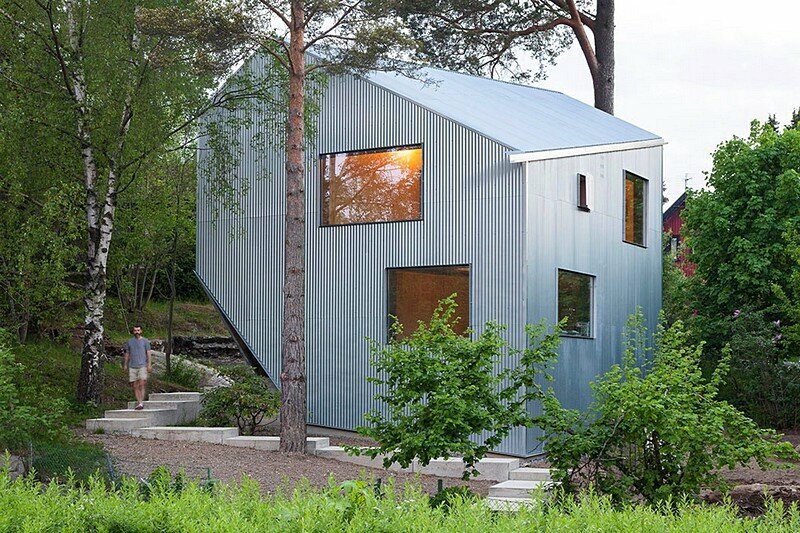 It was decided to make an inflection at about the center of the volume, just in the space of income, to create a break in the cover, to break with the so elongated proportions of the building. 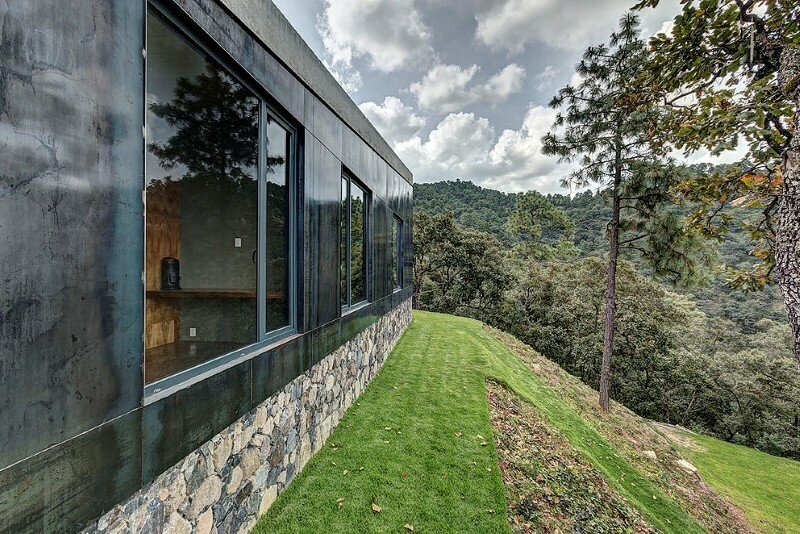 In plan, the gesture is repeated break on the north side to allow a more ample terrace overlooking might be the Volcan de Colima. 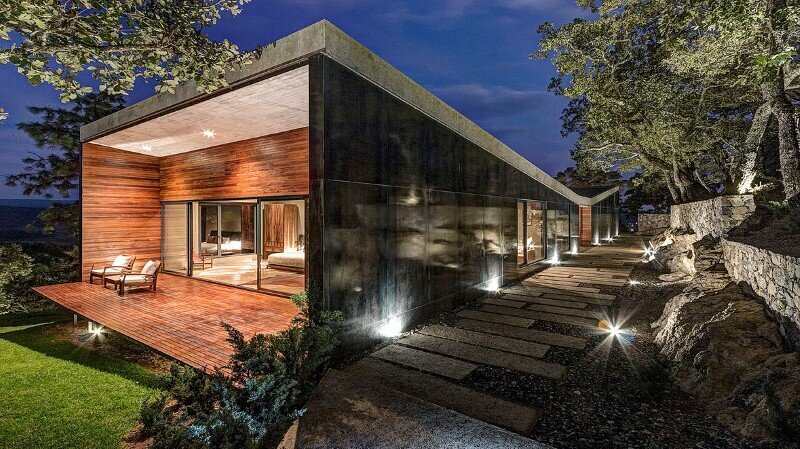 The lobby entrance through the building and breaks it into two equal blocks. 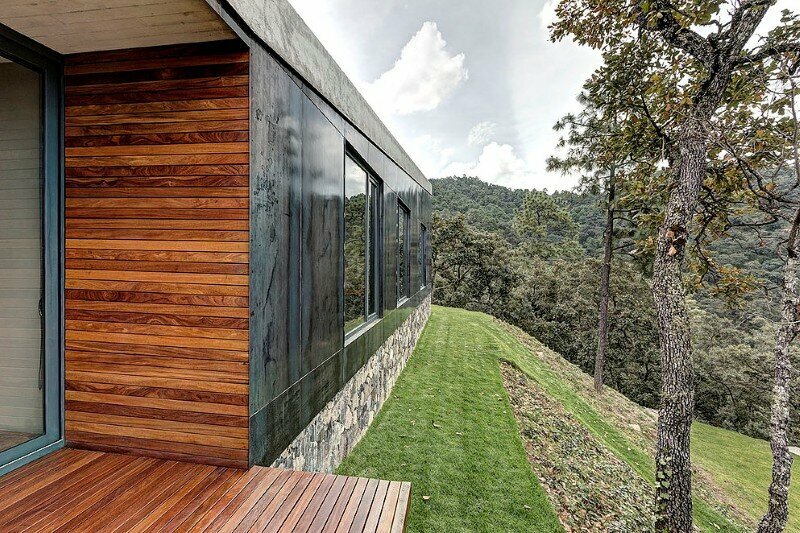 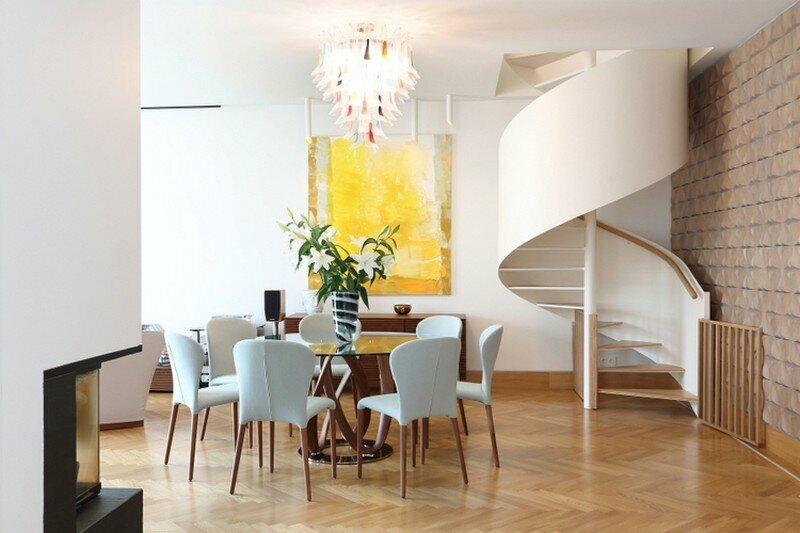 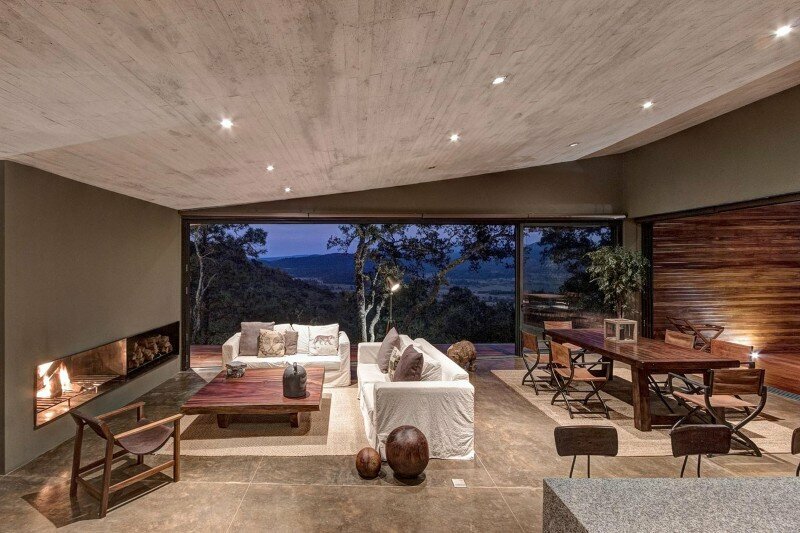 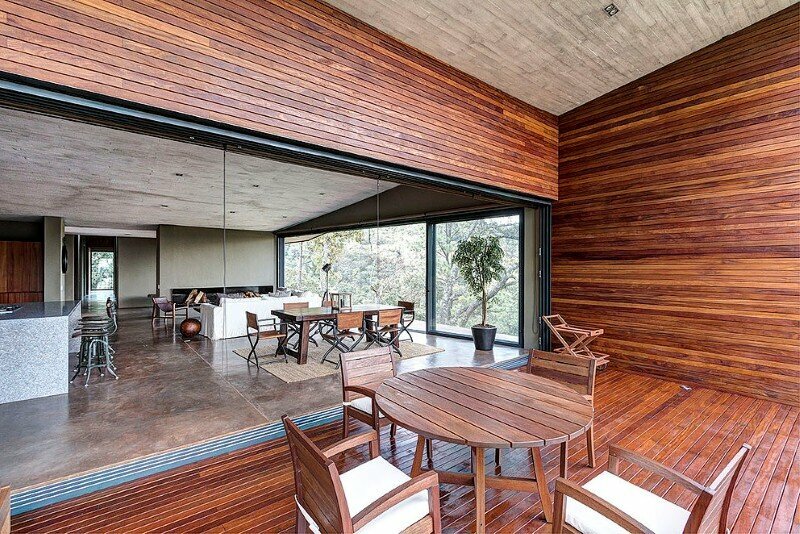 At the end of a coated block west of furring of cumarú terrace suspended above the ground, which is connected to the master bedroom through a window it is located. 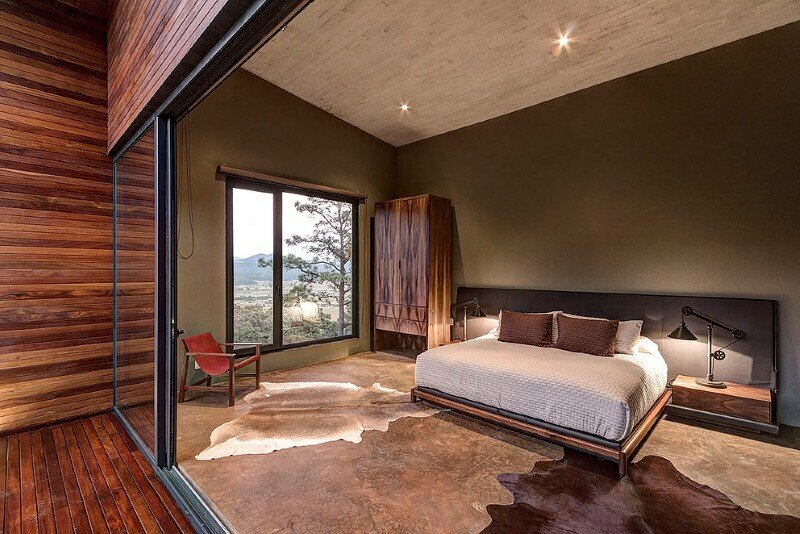 The rest of the program includes two rooms for visits, each also with its own bathroom, a guest bathroom and laundry area. 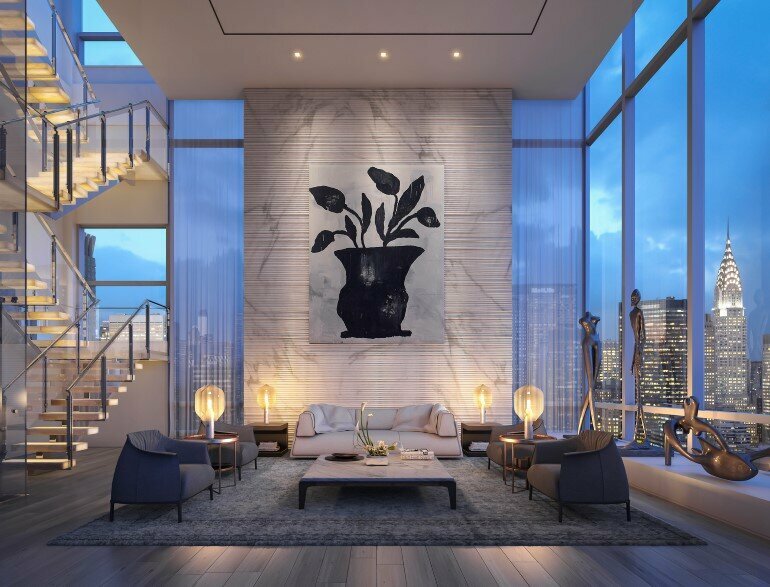 The block east of the entrance houses the living room, dining room and kitchen; all in one large space that is connected via a retractable window panels, a roof terrace that shimmers outer space at the other end and appears to float above the ground.